Privately owned and not open to the public. The castle is known as the site where the plot was hatched to assassinate Thomas Becket (1118-1170). More recently, it became the home of the art historian Lord Clark of Saltwood (1903-1983), then his son Alan Clark (1928-1999), a minister in Margaret Thatcher’s government, and the foremost political diarist of his generation. Between the ancient city of Canterbury and the site of the Roman port of Lemanis, which was close to Hythe, runs in an absolutely straight line for fifteen miles, due N. and S., the old Roman Stone Street, termed by Stukeley “a solid rock of stone,” and still the main highway. A mile from its termination, and N.W. of the town of Hythe, stand the remains of a strong castle picturesquely situated on the side of a pleasant little valley opening down to the sea. Round its ivy-covered walls circles a very broad and deep moat, whose waters are supplied by a little brook that flows through the valley. A Roman origin has been given to this fortress, but the citadel and camp of that warlike nation was placed at Lymne, opposite, on the declivity of the hill which overhung the port, and is now called Stutfall Castle, which was an enclosure of twelve acres, and which, though greatly injured by land¬slips, is well worthy of a visit. The original castle at Saltwood was Norman, and one of the towers of the outer wall is certainly of that work, though the greater part is much later, and it seems likely that Hugo de Montfort was its founder. As frequently occurs, this castle does not appear in the Domesday Survey, the office of which was to record the lands only, but this Norman certainly possessed the manor at the Survey date, 1086. Hasted states that it was rebuilt by Henry de Essex, Baron of Ralegh, and standard-bearer to Henry II. It is said that the lands were Church property in Saxon and Danish times, and when, according to Matthew Paris, Henry de Essex was defeated in a trial by duel for cowardice before the Welsh, he was allowed to live, but became a monk in Reading Abbey, his possessions being escheated to the Crown. Archbishop Becket then claimed them on behalf of his See, but they were only restored by John in his first year, after which time they were granted to various knights who held under the Church, with the King in capite. This brings us to the most interesting occurrence which is known in connection with Saltwood, namely the murder of Becket. When Henry’s demoniacal outburst of fury against Becket occurred at the Castle of Bur, near Bayeux in Normandy, in 1170, it was taken by four of his cubicularii, or gentlemen of the bed-chamber, as a point of honour “to rid him of this low-born priest,” and they actually started the same night for England to work his will. They were Reginald Fitzurse, Hugh de Moreville, William de Tracy, and Richard le Bret, all, except Moreville, men of Somerset, and proceeding by different roads to the French coast they crossed the Channel on the following clay; two of them landed near Dover, and the other two at Winchelsea, and all four arrived at the same hour at the fortress of Saltwood, which was occupied by a great enemy of Becket, Randulph de Broc, who welcomed them and their mission, he having three days before been excommunicated by the Archbishop. “In the darkness of the night “—(following Dean Stanley’s compilation)—” the long winter night of the 28th of December—it was believed that, with candles extinguished, and not even seeing each other’s faces, the scheme was concerted” in Saltwood Castle. Early next morning, levying some troopers in the King’s name, the knights rode off along the Stone Street to .Canterbury, and took up their quarters with Clarembald, the Abbot of St. Augustine’s Abbey. In the afternoon they rode to the great gateway of the Archbishop’s palace, and leaving their weapons outside, with gowns over their mail, they sought Becket in his private apartment, where he sat with his monks after the 3 o’clock banquet. The four knights confronted him here, and roughly made demands in the King’s name, which he put aside, and a violent altercation took place ; whereon the knights retired with threats, and passing through the palace shouting out ” To arms,” proceeded to take off their gowns and to arm themselves. Meantime the Archbishop, though fully aware of his peril, but refusing to secrete himself, had been hurried by the frightened monks into the cathedral, and he was ascending the stairs, which then, as now, led from the N. transept to the choir, in order to join in the vespers that had commenced, when the knights rushed into the transept, still known by its ancient name of “The Martyrdom.” It was then about 5 o’clock on the 29th of December, and night was gathering in ; the sacred building was lighted only by a few lamps in the shrines, and in the gloom the knights could but just discern a few figures mounting the steps. “Stay!” shouted one of them. Another : ” Where is Thomas Becket, traitor to the King?” :and “Where is the Archbishop?” To which the reply came, “Reginald, here I am, no traitor, but the Archbishop and Priest of God ; what do you want ?” and Becket descended to the transept and confronted his assailants. Here they closed round him, crying, “Absolve the bishops whom you have excommunicated;” when, turning on Fitzurse, he demanded why he came armed into the church. Fitzurse pressed an axe against his breast and said “You shall die—I will tear out your heart.” Then a scuffle ensued in which Becket hurled Tracy to the ground, and called Fitzurse by an opprobrious name, whereon the latter struck at him, only dashing off the cap, when Tracy, rising, dealt a heavy blow which was intercepted by a monk, whose arm fell broken, while the sword, grazing the head of Becket, fell on his shoulder. Two blows followed : the Archbishop fell on his face, and le Bret struck him as he lay a tremendous sword-cut, which severed the top of the skull, the sword being shivered on the marble pavement—a veritable Gabbatha—whilst one of the followers scattered the dead prelate’s brain with his sword. Then the party of murderers, leaving their victim, rushed away to plunder his palace, after which, taking horses from his stable, they rode away through the night back to Saltwood Castle, with no very enviable feelings, one would suppose, about their cowardly and sacrilegious deed. 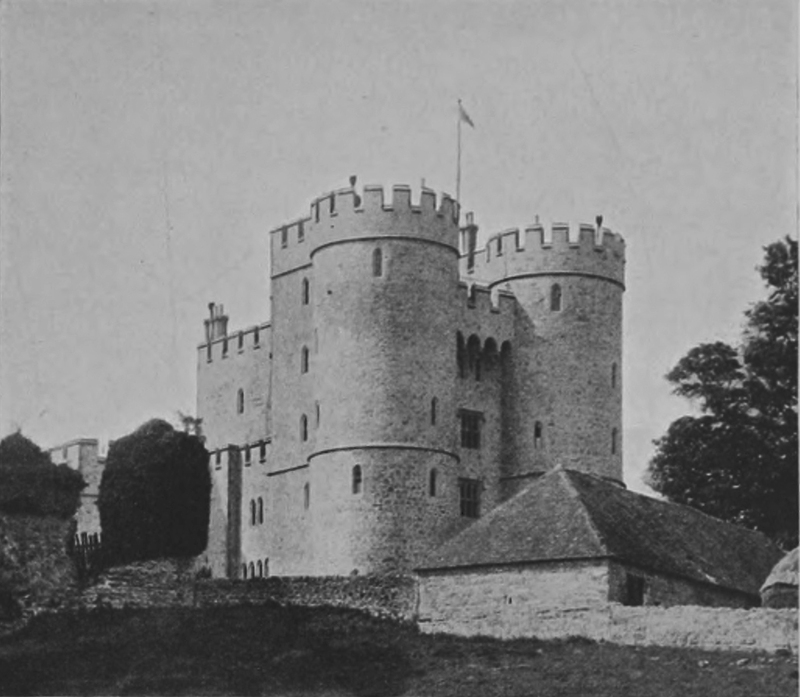 Next day they rode forty miles to South Malling, one of the Archbishop’s manors, near Lewes in Sussex, where, entering the house, the tradition goes, the knights flung off their arms on a large dining table in the hall ; “suddenly the table started back, and threw its burden on the ground,” refusing to bear it ; and this occurred twice—the earliest instance, Dean Stanley remarks, of a “rapping, leaping, and turning table.” From this place they went through the land to Yorkshire, and took shelter at Knaresborough Castle, a Royal fortress then in the possession of one of them, Hugh de Dioreville, where they remained for a year. After King John’s restitution of the castle and manor to the See, it so remained until exchanged by Cranmer, in 31 Henry VIII., for other lands with the Crown, the castle being occasionally used as a palace by the archbishops. The area enclosed by the outer walls is elliptical, the large outer court being until of late years, converted into a farmyard, which may have been always its purpose. (Parker.) Across the moat is the splendid gatehouse, a complete house in itself, of which arrangement it is a very fair example : it was chiefly built (temp. Richard II.) by Archbishop Courtenay, who held the See from 1381, and whose arms it bears in front ; he expended large sums upon the place.